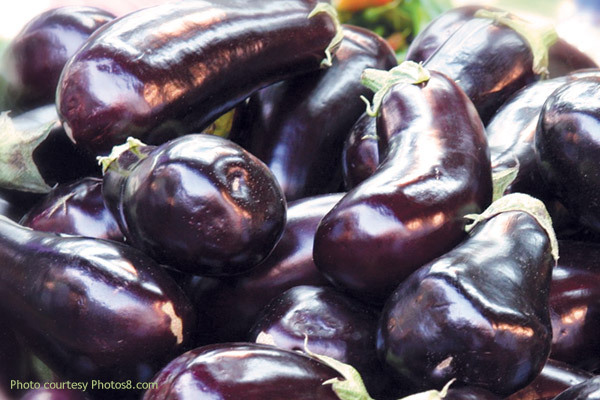 One other thing, don’t shy away from trying eggplants other than the dark purple/black ones. Our local farmers markets offer white, yellow, and striped varieties. The lighter colored ones tend to not have the slight bitterness of some eggplants. - Cut off ends of eggplants. - Slice into 1/2” strips, lengthwise. You can go thicker or thinner, but keep in mind it will affect cooking time. I find 1/2” to be a good size. - Mix egg and milk in a bowl. - Combine dry ingredients in a plate or bowl. - Grease baking sheet with oil mister or cooking spray. - Dredge the strips in flour, then dip in egg/milk mixture, then dredge a second time in flour. - Spray or mist strips with oil to lightly coat as much as possible. - Bake 10-15 minutes a side, until browned on each side and tender. - Serve hot with a condiment of your choice. I really enjoy these with the hickory ketchup from Garden Secrets at the Boalsburg Farmers Market.